It seems when kids leave for kindergarten, I struggle getting new kids. I've been doing this for over 3o years and my parents love me and I love them. My educational program is exceptional so you would think they would be knocking my door down. I have a small group home daycare of 6 and have to find 3 more kids or I'll have to close my daycare. So frustrating. Any new ideas? local college and at the local DHS office advertising openings. Join in and write your own page! It's easy to do. How? 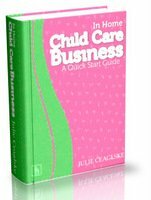 Simply click here to return to Child Care Business FAQ. We built this website ourselves with Solo Build It.It was easy, with a step by step video guide! Check it out at the links below. Solo Build It!--How we built this web site without knowing anything about making money on line or how to build a web page!! We work from home, check this out for 1 minute and you will see why we can! This is THE book you need to get your business started!! Click here to see what I mean.